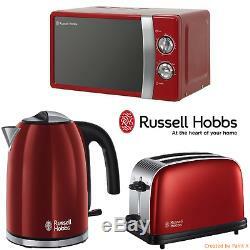 Russell Hobbs Red Stainless Steel Microwave Colours Plus Kettle 2 Sl Toaster Set. Looking for a matching colour microwave, kettle toaster set or other matching colour appliances for your kitchen? You're in right place, we're also creating custom appliances sets for your requirements. And we'll answer you within 2 hours or choose colour or style below to see our full range of microwave kettle & toaster sets or other coloured kitchen appliance sets. 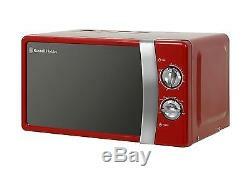 Russell Hobbs RHMM701R 17L 700W Manual Microwave, Red. Compact and stylish, the RHMM701 is the perfect everyday microwave, ideal for cooking a variety of meals in minutes. Once you have prepared the microwave for use, simply place your food in suitable cookware, open the door and position onto the turntable. When the cooking cycle has finished the microwave has a handy ringer function that will sound to alert you. You can tailor cooking to suit your recipe using the 5 power levels available. For added functionality, there's also a defrost setting. Easy to clean, simply wipe with a damp cloth to maintain excellent performance. The chic and trim design means you have flexibility in choosing the perfect spot to show off your new appliance. Once you have prepared the microwave for first use, simply place your food in suitable cookware, open the door and position onto the assembled turntable. Next all you need to do is select a power level and the cooking time required by turning the easy to use dials, found on the control panel. The internal microwave light lets you know that cooking is in progress. Cooking has never been so easy. With the RHMM701 you can tailor cooking to suit your recipe using the 5 power levels available for selection. For added functionality, there's also an essential defrost setting, saving you time so that you can cook meals straight from the freezer. Choose the RHMM701 for the ultimate in microwave cooking convenience. 1 x Russell Hobbs Manual Microwave, 1 x Turntable. 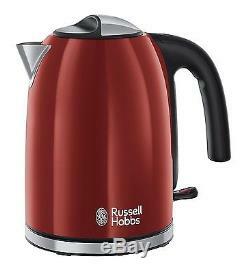 Russell Hobbs 20412 Colours Plus Kettle, 3000 W, 1.7 Litre, Red. Rapid boil zone feature - You can boil 1 cup in 45 seconds by boiling 1 cup (250ml) vs. Pull to open hinged lid. Russell Hobbs 20412 Colours Plus Kettle, 1.7L, 3000W - Red Rapid boil zone feature - You can boil 1 cup in 45 seconds by boiling 1 cup (250ml) vs. 1.7 litres 1.7L capacity Pull to open hinged lid Side water gauge. 1 x Russell Hobbs Colours Plus Red Kettle. Russell Hobbs 23330 Colours Plus 2-Slice Toaster, Red. Up to 50% faster toasting vs Russell Hobbs Colours Red Toaster, No. Lift and Look feature - so you can check your toast without cancelling the cycle. Frozen bread function, cancel function & variable browning control. 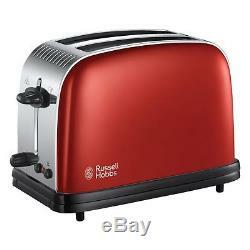 Russell Hobbs 23330 Colours Plus 2 Slice Toaster - Red Up to 50% faster toasting vs Russell Hobbs Colours Red Toaster, No. 18952 Lift and Look feature - so you can check your toast without cancelling the cycle Fits all bread sizes Frozen bread function, cancel function & variable browning control. 1 x Russell Hobbs Colours Plus Red 2 Slice Toaster. ALL ITEMS SENT DIRECTLY FROM APPROVED 3rd PARTY SUPPLIERS. These items may be dispatched directly to you from a third party distributor. You must have a confirmed address. This allows our products to remain very competitively priced. Please note, bundled items may arrive separately and on different days because we may use different suppliers. We may also re-use packaging when appropriate as an attempt to reduce our overall environmental impact on the planet. Please note that any pre-existing damage of the received item/s MUST be communicated within 24 hours after the item has been received; failure to do so may result in us (on our supplier's behalf) not granting you the return. When returning an item, it must be in all of the original packaging and include all of the original accessories or items that came with it. The item and package should be in original and perfect condition. We do our best to process as quickly as possible. We request you to try your new item/s as soon as you receive them. If the item in your opinion doesn't correspond to pictures and/or descriptions, you MUST inform us within 24 hours after the item has been received; failure to do so may result in us (on our supplier's behalf) not granting you the return. If you changed your mind about the item, but nothing is wrong with the item itself e. It works properly and perfectly corresponds to pictures and descriptions, we (on our supplier's behalf) may not grant you the return. Check out my other listings. The item "Russell Hobbs Red Stainless Steel Microwave Colours Plus Kettle 2 Sl Toaster Set" is in sale since Friday, May 20, 2016. This item is in the category "Home, Furniture & DIY\Appliances\Coffee, Tea & Espresso Making\Kettle & Toaster Sets". The seller is "*microwave-kettle-toaster-sets*" and is located in London. This item can be shipped to United Kingdom.